If you're new to Honey, one of the first things you'll want to do is set up your Honey profile. Lucky for you, it's quick and easy and shouldn't take you more than a few minutes. Here's how. Select View Profile from the menu. Click the gear icon located in the bottom, righthand corner of your avatar photo space. 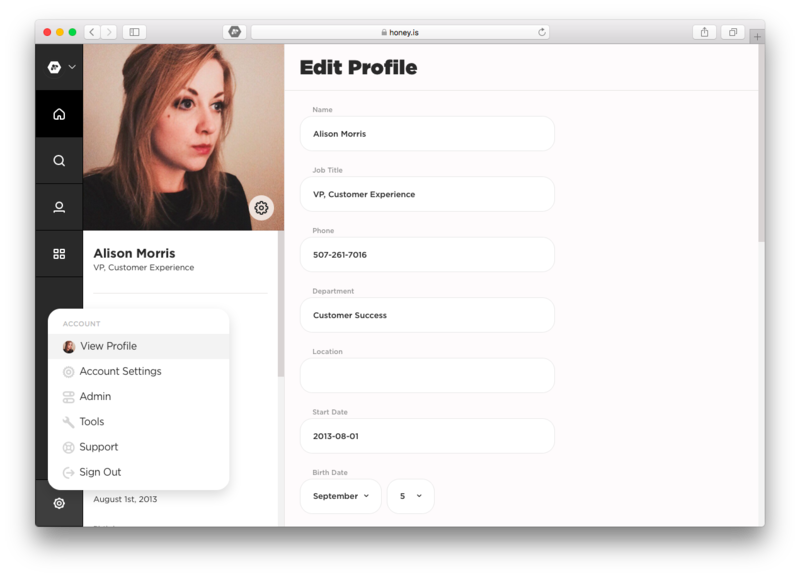 Then, in the dropdown menu, upload a photo from your computer or use the profile photo you've already added to your Google, Facebook, LinkedIn, or Gravatar profile. Click the gear icon located in the bottom, righthand corner of your avatar photo. Select Edit Profile from the dropdown menu. In the text entry fields, add information about yourself. When you're done, scroll to the bottom of the page and click Update Profile.